New for the Tau is the XV-9 ‘Hazard’ Close Support Armour, an original battlesuit design intended to act as a powerful counter-attack unit and mobile weapons platform. A recent addition to the Tau arsenal created in response to heavy losses incurred during the bloodiest phases of the Third Sphere Expansion, the XV-9 is one of the most complex and advanced combat systems the Tau have ever put into wide production, requiring a veteran’s skills to master in combat in service of the greater good. Designed by Daren Parrwood, the XV-9 is larger than a standard crisis suit as you can see Here and looks sleekly lethal. This first version comes equipped with two twin-linked burst cannon. We should have a limited supply of this model available at Games Day UK, and the model will go on general release later in the year. Another advancement for the Tau Empire from Forgeworld. Essentially this is another Tau Battlesuit with +1 toughness, 2 twin linked burst cannons and vectored retro thrusters (which nobody uses). When I saw the thumbnail for this models on the Forgeworld Newsletter I squealed like a little girl. But then I had a closer look and I must say that I'm not that taken with it. Thank god it's a Fast Attack choice though. Tau need all the fast attack choices they can get! 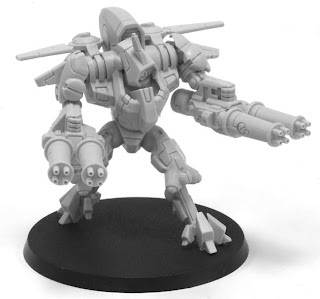 Having seen the previous Forgeworld Battlesuits and the new Farsight concept model (which will never be released) at last year's UK Games Day it seems like a serious technological redesign of the Tau may be on the cards in the far future. We'll see what the future brings, but in the meantime, I'm not enthralled by this model -which is a shame. Although all Tau Battlesuits need toughness 5 if you ask me! Well it looks really cool, but since I usually fight against SM I can't really use it. I totally agree; other than the fact that you get to have a crisis suit as fast attack, it doesn't seem appealling. unless there are other weapon choices i probably would not use it. i am not one for fielding burst cannons on battlesuits as i have enough f/w teams of the same weapon stats. this is also why i dont field stealth either! now if they could take flamers, that's another matter! I kind of like it, other than the size. The basic design reminds me of Battletech's Goshawk ( http://www.sarna.net/wiki/images/thumb/a/a9/Vapor_Eagle(Goshawk).jpg/191px-Vapor_Eagle(Goshawk).jpg ) which is fine by me. Not so sold on the 60mm base, but T5 would be nice. I wouldn't mind Tau suits getting a bit sleeker; compared to the tanks and piranha, they're kind of boxy and ugly. If Tau are heading for a sleeker, sexier look then I'm all for it. Any links to or pics of the Farsight concept model? Funny. I am absolutely taken with this model but I bet it will be a b@tch! to put together. The only thing I have qualms with are the legs. They are kind of slim for my tastes. I'll be getting this model and beefing out those legs and feet a bit. The rules are ok, it could work as a close-range distraction unit, although its a pity that it only has a 3+ save, i was hoping for a 2+ when I read the fluff. I like it! But not the twin-linked burst canons... they're a little big for that arms... but it's cool anyway! As much as I like it, especially as a good harasser on lightly armored targets I fear it is a bit of waste. I think once we're past the experimental rules & able to put different weapons on the suit the XV-9 should be a fantastic unit. I like the look, it's different enough from the existing models and does look very 'alien'. Any idea on the rules? Or are those in IA vol3? Now if they made this as the new stealth suit.... then i would certainly use stealth. Unless it has a better initiative than the average Tau battlesuit, the vectored thrusters are useless. As is, it's not exactly a great Fast Attack option, although a unit of three XV-9s deep striking in could be murder on lighter infantry. I do like the higher toughness, though. I will say I that I'm not taken with the actual design; the limbs are a bit too thin and gangly for my tastes. Personally, I like the stockier XV-8 design. Agreed, I don't like the massive base. It also looks like it would be utterly horrendous to try and actually glue on the base. It would be pinned like crazy. Still, it's an interesting change from the normal battlesuits, i don't think i've ever seen a standard XV8, they're always converted in someway. Hope it's not a whole army redesign soon since I just started painting up my new army! apart from the burst cannons that is. I mean, four of those long barrels close together dont look that good at all, maybe if the barrels where a lot shorter for a "burstier" feel. Or just a redesign of a twin linked burst cannon in general, sticking two together seems kinda lazy and geez boy does it look awkward! And I totally agree with Crisis suits having T5 Adam! It just always seems wrong that those big heavy suits get insta killed by those measly melta weapons and explosives! I mean ok, they should probably loose a limb or something but not get killed! Very 'japanese' looking, look at it compared to some of the Armored Core designs in AC4 and AC:FA. Dual twinlinked plasma rifles please? This to me looks like the anti-infantry version of the XV88 Broadside. Instead of being slow-moving platform, with these oversized railguns for taking out tanks, you have a fast platform designed to take out infantry with a torrent of firepower. It's clearly designed to "kite." Move in to within 18" in the Movement phase; shoot; then jump back at least an inch in the Assault phase so their infantry can't move 6" forward and Rapid Fire you. It has some merit against the light infantry armies (Imperial Guard, Orks, Tyranid), but unless the burst cannons are eventually allowed to be swapped out for flamers (I doubt they'd allow plasma rifles on this thing) I don't think it will see much use elsewhere. A Toughness of 5 will help against inevitable return fire, but will it be enough? These XV9s seem to only be working in solo teams, unless the Special Issue rules for Vectored Retro Thrusters are changed. P. S. They seem to be sniper prey, if you ask me. OK, I can see some of you guys do not get email updates from forgeworld or you would know the preliminary rules for this suit. As you will see, with drones the retro thrusters work. Squad size is 1-3 +drones and other weapon options will follow. I love this suit, great for dealing with 'nids (the most over-powered army in the game IMHO). I Agree with those that say all crisis suits should be T5 too but given the choice I would take a better BS over Toughness anyday, lets face it bs3 is OK for 'la's but for 'ui's and 'vre's it's a bit weak. My only real concern with this suit is going to be over the price. Graham: Actually BS3 is the standard for ranks up to 'Vre. Take a look at the statlines for Crisis suits. But the XV9 really should have access to targeting arrays anyway--their wargear selection is pretty pathetic as-is, even ignoring that as Shas'vre they should all have access to hardwired gear. Hoping that gets ironed out in the final revision of the rules. lets face it bs3 is OK for 'la's but for 'ui's and 'vre's it's a bit weak. ....your point about the wargear is valid however. I am sure there will be other weapons options. 2 twin -linked weapons is perfect! Imagine 2 twin linked plasma rifles. With those wings on its back, hopefully it get's the Fast Attack Scout rule. Can anyone verify the weapon list above? I'm skeptical, frankly. like 'em enough to convert a few units - serpent customs work well w/ xv-8 parts where needed - and think know what the issue here is: these suits meant ti be put in the sh*t. VR thrusters work here w/drones, so have to take drones. XV-9's should also have 5+ invulnerable save/self-destruct/better jetpack rules(like swooping hawks) to complete idea, but can't have everything. Fast attack, and since can't have Remora in some tournaments, might be nice to have a unit to protect pathfinders & let 'em use those seeker missiles - devilfish could use the help for sure.